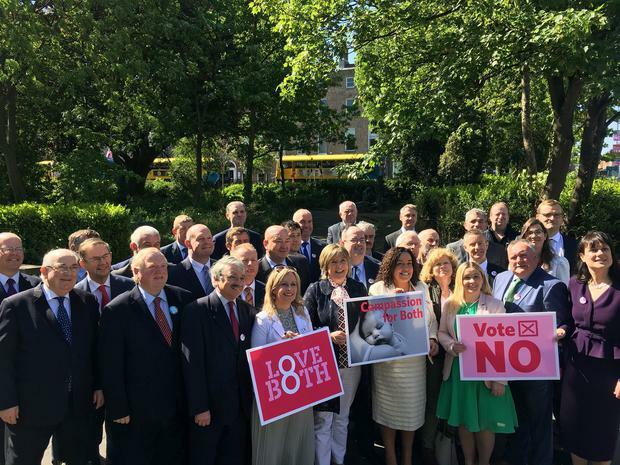 Members of Fine Gael, Fianna Fail, Sinn Fein and Independent TDs gathered in Merrion Square this morning to pose for a photograph supporting a No vote in the referendum. A cross-party group of more than 30 TDs and senators are calling on voters to against a referendum proposing the removal of the Eighth Amendment of the Constitution. The event was organised by Fianna Fail TD Mary Butler, who is a prominent member of the anti-abortion No Campaign. Two Fine Gael Ministers of State, John Paul Phelan and Ciaran Cannon, took part in the event. Fine Gael senators Tim Lombard, Paul Coghlan and Maura Hopkins were also present for the photograph. Former Fine Gael Ceann Comhairle Sean Barrett and Louth TD Peter Fitzpatrick sent their apologises. The Sinn Fein members involved were Peader Toibin and Carol Nolan. The vast majority of the politicians in the photograph were members of Fianna Fail. In addition to the 15 TDs and senators present, seven Fianna Fail members apologised for being unable to attend.